Winter is a harsh month to get through, mentally and physically. Typically by the end of the season, my skin is completely dehydrated and I lose track of the amount of headaches I've had. 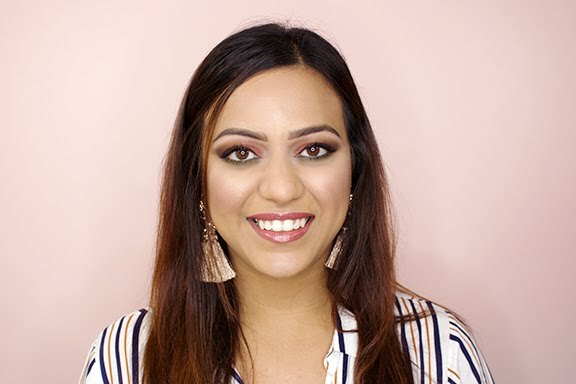 However, one thing that really stood out this year from the rest are my lips.... Epic Blend Premium Lip Balm truly saved them! Made in Canada, for Canadian winters, Epic Blend Lip Balms are made with organic and natural ingredients to prevent your lips from cracking, drying, bleeding or becoming chapped. 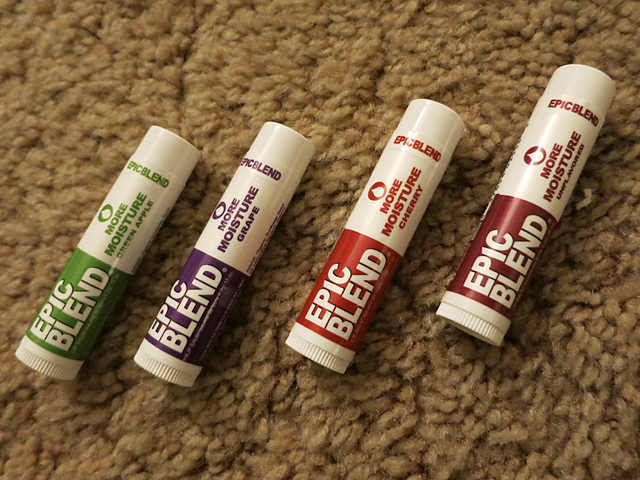 I was really surprised to find out that Epic Blend actually doesn't use sugar in any of their products; sweetened lip balms entice you to lick your lips more and that makes them dry quicker! They come in many different (and interesting) flavours; all gluten-free, some are vegan-friendly, others have a blend of hemp seed, and for more moisture they've made a batch with shea butter. I was fortunate to be able to try 12 flavours over the course of the last few months. 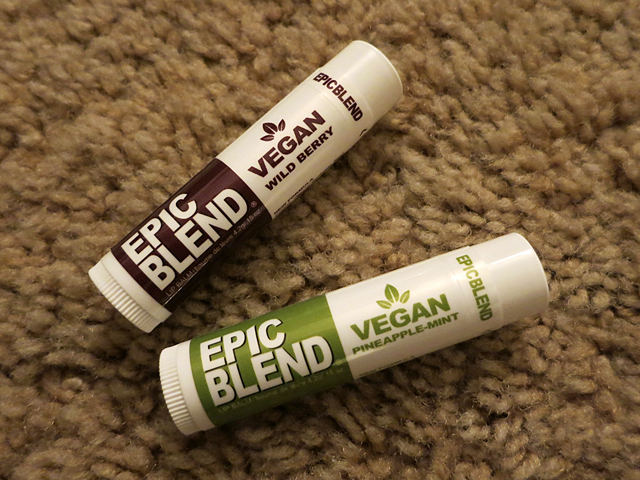 The type I was most excited to try came first: Epic Blend Vegan Lip Balm. These are beeswax-free with ingredients such as organic sunflower seed oil, candelila wax, organic cocoa butter, organic coconut oil, vitamin E, as well as flavouring for each one. I won't lie, these have an initial bitterness to them, but once the moisture seeps into your lips, you don't taste it at all but moreso the flavour that you choose. 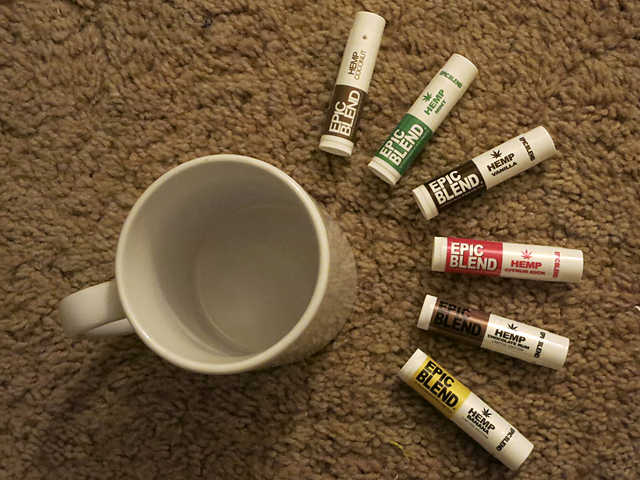 Next I tried Epic Blend Hemp Lip Balm collection. They have the most variety of flavours in this type of balm, and they are all classics such as coconut, mint, vanilla, banana as well as two that I'd never seen before: citrus rock and chocolate rum. It was so hard to tell that these balms were organic because they all really do taste and feel similar to the other blends out there on the market. The ingredients for the hemp blend are similar with the addition of organic beeswax, organic hemp seed oil and of course, the flavour to make each product. I'm a sucker for shea butter, so "naturally" (no pun intended), the Epic Blend More Moisture Lip Balms were my favourite out of all. This batch is made with organic sunflower seed oil, organic beeswax, organic cocoa butter, organic coconut oil, organic castor seed oil, organic shea butter, vitamin E and flavour according to each balm. Out of all three, I found these to be most preventative and they have really helped keep my lips hydrated and moisturized this winter. The more moisture collection's staying power is better than the other two. I also love that they have an "unflavoured" balm, which I have used the most. Sometimes you really don't want to taste anything on your lips! 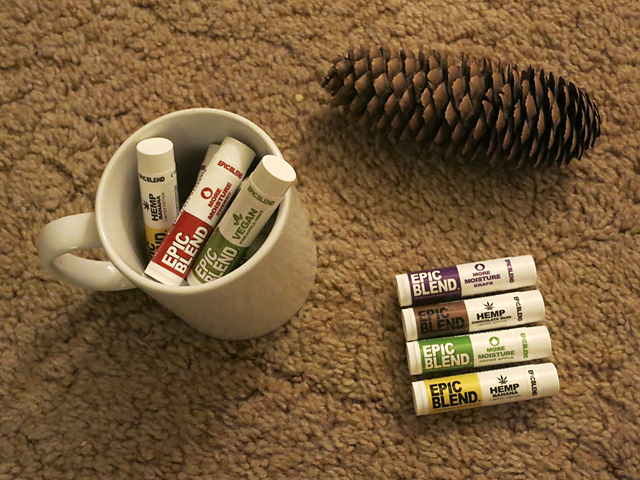 Will you be giving Epic Blend Lip Balm a try? They are reasonably priced at roughly $3.50 CAD or you can order a 4-pack for $12.